We finally got some chooks. It is great to see them wandering around. It has taken them a couple of days to get settled. When we released them in the pen they would not leave each others side. They were used to being caged tightly together. The first couple of nights I trained them where to roost. They were happy to roost on the ground in torrential rain. I donned the raincoat and moved them to the perch inside. I had to do this for the first 4 nights. In spite of the rain they picked a position outside which was the highest northern point in the pen. The coop is lower down the block. The perch is 75 cm off the ground but this has not been a problem, they jump/fly up. In the photo above is our chook feeder. It is an old garbage bin. It has a large tray (pot plant water tray) attached to the bottom. We cut rectangles out of the bottom of the bin allowing the grain to drain through. The base of the bin remains, it just has holes around the side. The rim of the tray is higher than the holes. It has been working great. We can leave them for long periods as a lot of grain fits in the bin. The feed is half poultry mix, half cracked corn with some shell grit. The water is in another plant pot tray. 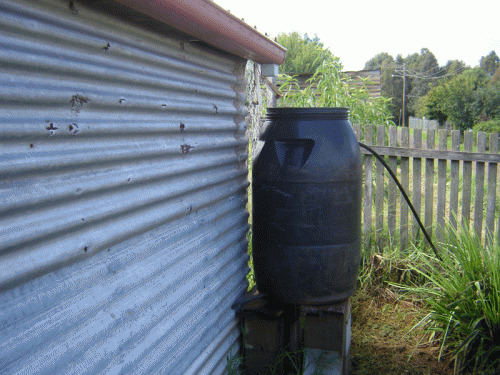 I had put guttering on the chook pen with a pickle drum for a water tank. 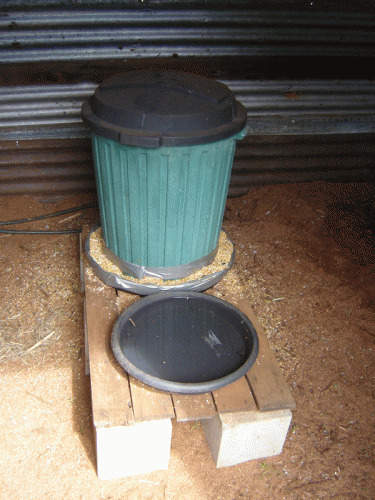 A hose at the base of the drum enters the chook pen to the left and a overflow hose goes out to the street gutter. The hose inside the shed has a simple garden tap on it with which I can fill the chooks water. If I left the tap slightly open I could have continuous water for the chooks. This is a picture of the laying area. Hopefully the chooks will lay eggs here. It is the same height off the ground as the roost, on the opposite side of the shed. 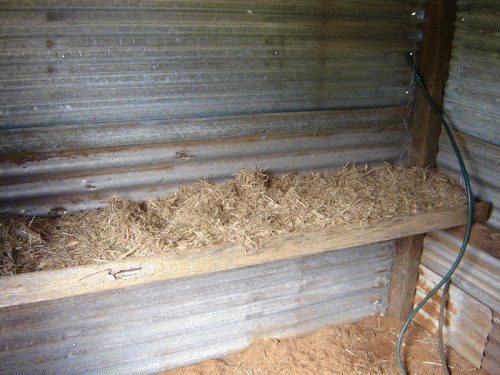 We have added sugar cane mulch for comfort and wood shavings to fight lice. We are also growing tansy in the yard as this is good for their digestion. We have other plants on order that are beneficial. No eggs yet but soon, they couldn't have a more comfortable existence. 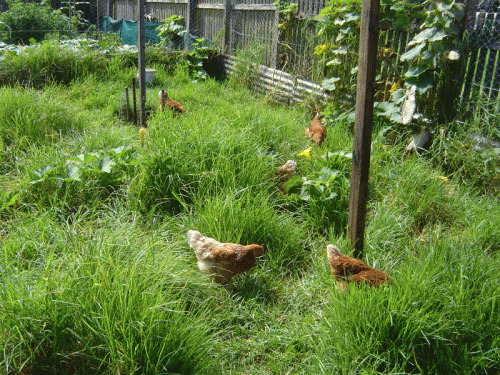 Stage 3 - Chook Feeders.